There's a very interesting discussion going on over at Civil War Memory about John Stauffer and Sally Jenkins' new book, The State of Jones. I haven't weighed in on the comments thread because John Stauffer is my department chair, so I feel it would be inappropriate for me to comment. Nevertheless, I have been following the debate with great interest. I don't have much to add on the subject of Jones County, but if there's one thing we love here at VPI, it's onomastics! In their comments on Civil War Memory, Prof. Stauffer and Ms. Jenkins ask, "How many white Southerners do you know who, in 1868, named a son after Ulysses S. Grant?" As it happens, quite a few. 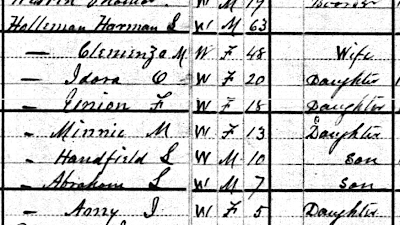 1) The 1870 census shows 103 men with the first names "Abraham Lincoln," "Abe Lincoln," or "Abraham L." living in the 11 ex-Confederate states. Most of the little Abes lived in Tennessee, Virginia, or Arkansas. All of the Abraham Lincolns and Abe Lincolns were born during or after the war. 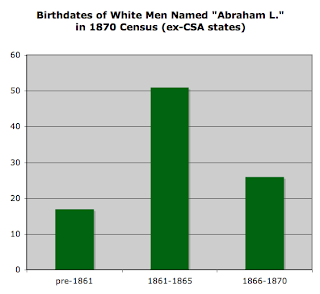 Some of the men named "Abraham L." were born before the war (18%), but 82% were born during or after the war, which tells me that most of them were named after Lincoln. 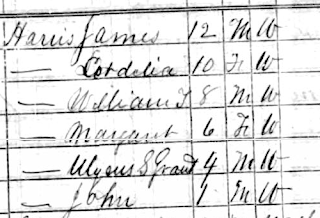 I count 494 men and boys named "Ulysses S. Grant," "US Grant," "Ulysses Grant," "General Grant," or "Grant" in the 11 ex-Confederate states in the 1870 census. The vast majority of those are simply named Grant. 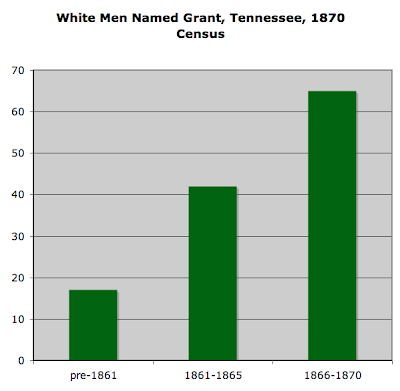 In some states (AL, LA, FL), the number of boys named Grant born before the war was about the same as the number born after the war, indicating that those born after may not have been named for the general. 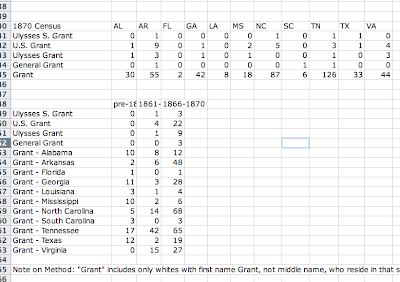 In states with strong Unionist naming trends (AR, NC, TN, VA), the number of little Grants shot up during and after the war, which indicates that many of those boys were indeed named for Ulysses S. Grant. This is just a smattering of the pro-Union names given to white children in the Confederate and post-Confederate South. From General Sherman Dobbins of Floyd Co., VA (b. 1866) to Abe Lincoln Britt of Henderson Co., TN (b. 1866), hundreds of boys (and a few girls) wore their families' pro-Union sympathies in a very public way. Some were clustered in commuities, like three little boys named U.S. Grant (b. 1867, 1869, 1869) living in Richland, AR in 1870. 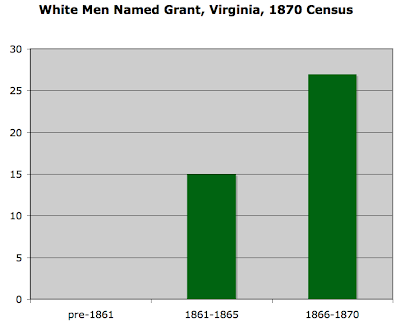 How many white Southerners named a son after Ulysses S. Grant? 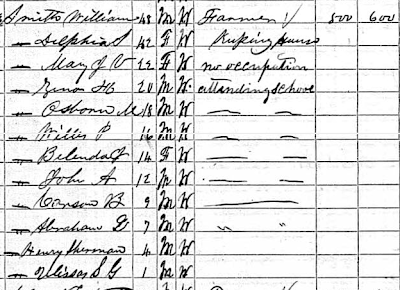 Note: My charts do not include Ulysses Collins, son of Jasper Collins, because he is listed in the transcription of the 1870 census as "Ulysses L. Collins." This means that my current methodology probably undercounts Unionist naming in the South. My numbers include neither boys whose names are recorded simply as "Ulysses" nor those with the middle name "Grant." Glad to see you decided to share some of this research. Perhaps you should post a comment along with the link, though I may get a pingback at some point. Great work! My g-g grandfather from McNairy County TN named his son William Sherman McCann. It must have taken some gumption to name your child after a Union war hero. I was glad to see this aspect of the debate picked up and that you are digging around to find out how widespread the pattern was. I was struck by it in my own work--the introduction of my book opens with a reflection of this pattern among unionists in Alabama: "From the 1870s through the 1930s, the Palmer family of northwestern Alabama named its children after Civil War heroes. Like many Southern families, they did so to memorialize the family's sacrifice and loss during the war--but here the similarities ended. Instead of the perennial favorites of Jackson, Lee, and Forrest, Palmer children had names like Alexander Sherman and General Grant, monikers as close to fighting words as one could choose in postwar Alabama. Later generations bore the names of Republican presidents: Harrison Rowe, Herbert Hoover, Clover McKinley. One man gave his six children, all born in the early years of the twentieth century, names beginning with the letter 'R' for 'Republican'" (Storey, Loyalty and Loss, 1). I also found one case of a unionist family naming their son Abraham Lincoln in 1860, which prompted a threat from his community that the father would be run out of the county if he did not change the child's name. And not just sons were the bearers of political culture: one family named their daughter Mollie Ann LINCOLN, also in 1860. Thanks for sharing your findings--they are very interesting! My Great X 4 Uncle Jonathan Smith of Letcher County, Kentucky (extreme southeastern Kentucky - up in the mountains) named his son U.S. Grant Smith in 1872 or so. Jonathan I believed was a Union soldier during the war and his family were Appalachian Unionists I think. This area of southeastern Kentucky was the only place that remained Republican during the 19th century. U.S. Grant Smith later became sheriff of Harlan County, KY (a very Pro-Union county). my name is david ratcliff. i am a pharmacist in petal, ms. i am a fifth generation mississippian on my mother's side of my family. my ancestors on her side are all from jones county (i also grew up in laurel,ms). my great grandfather's name is charlie ulysses grantham.he was born in 1876. my son's name is grant (after the family i respect so much). i just finished the book by john stauffer and sally jenkins about the free state of jones. i have read them all as an amateur history buff. this work is, as far as i'm concerned, the absolute very best of them all (including viki bynum's put-u-to-sleep variation).this was a complicated time with complicated people and some conjecture on the part of an author is required to put forth the whole story. surely all is not totally correct concerning the story of newt knight, but here, at least, the authors tried to illustrate things in the most realistic light possible. local folklore is a little less complimentary to newt but after all we are at ground zero concerning the story. i applaud the authors of "the state of jones" for their research, effort and literary contribution to an old, old story here in jones county. bravo! and well done! next time you are here look me up and i will take you to the original homestead of my great-great grandfather, daniel grantham---a champion of the union!!!!! !